The palace derives its name from the Krishnaswamy Temple, which is within close proximity. 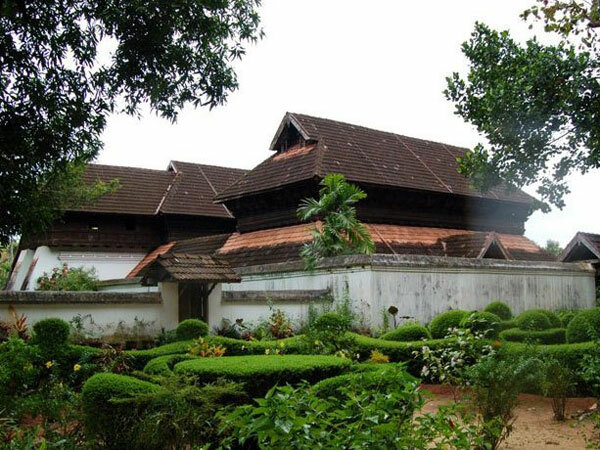 Krishnapuram Palace was built by the Travancore King Marthanda Varma in the 18th century after his victory over Odanad, a feudal state in medieval Kerala. Varma built the palace by demolishing the original palace belonging to King Ravi Varma of Odanad. The Krishnapuram Palace was an ettukettu (local term for small single-storey palace). A pond next to the palace adds to the serene beauty of the palace. Various buildings added in the following years reflect a mix of traditional and western architecture. The palace is presently looked upon by the Archaeological Dept of Kerala, which had undertaken renovations for the palace in the 1950s. Like most Indian structures, the Krishnapuram Palace also confirms to vastu shastra. It has 16 blocks with 4 courtyards and 22 rooms. The windows and doors are constructed to optimise fresh air circulation and natural light penetration. Intricate woodwork designs and tile roofing in gabled style provide a view of the uniqueness of the Kerala architectural style. The palace stands atop a small hill amidst gardens and ponds looking out upon the old NH47 in the distance. The palace, which also houses a museum now, has a vast collection of ancient paintings and inscriptions, coins and artefacts made of wood, brass and stone sculptures. 1. The Gajendra Moksham is a 14x11 ft mural which is the biggest mural collection in Kerala. 2. The Kayamkulam Val (val is sword) is a special type of sword for it has both its sides sharpened, thus, making it more lethal in combat and it was a favourite amongst the Kayamkulam kings. 3. Also amongst the display is a Buddha statue which is one of the 4 antique Buddha statues found in the region. This statue is placed in the Buddha Mandapam (hall) and predates even the palace. Amongst the more discreet yet unique finds in the palace is a copy of the Bible in Sanskrit language printed in Calcutta (present day Kolkata) from 19th century. Timings: The palace is open from Tuesday to Sunday from 9 am to 4.30 pm with a break between 1 pm to 2 pm. The best time to visit Krishnapuram Palace is from September to January, the former half provides a relaxing monsoon experience while the latter half will give you a cool breezy ride. Kayamkulam is the closest major town which is well connected to major cities by buses and travel by private vehicles is also convenient as the palace is close to the NH47. The closest railway station is Kayamkulam railway station. The closest airport is Trivandrum airport, 104 km away, well connected by road to Kayamkulam. Other major Kayamkulam attractions are Ananthapuram Palace, Sri Subrahmanya Swamy Temple, Sree Dharma Sastha Temple, St Mary's Malankara Catholic Church, St Thomas Orthodox Cathedral and Kovalam Beach. Bit further away are also Alleppey Backwaters (50 km) and Varkala Beach (60 km).